A limited company is a separate legal entity from its owners and as such provides the benefit of limited liability status, so that if there are any company debts, you the shareholder may not be legally liable to pay those debts. If you also work for the company, you are both the owner (shareholder) and an employee of that company. When a company generates profits, they are the company’s property. Should you wish to extract money from the company, you must either pay a dividend to the shareholders, or a salary as an employee. The advantage to you is that you can have a balance of these two to optimise your overall tax and national insurance liability. Companies themselves pay corporation tax on their profits after paying your salary but before your dividend distribution. Effective tax planning requires profits, salary, pension, benefits and dividends to be considered together. The Directors of Limited Companies have a legal requirement to maintain accurate accounting records, prepare annual accounts consistent with accounting standards and file with companies house, collect taxes and file tax returns for income tax, National Insurance, VAT and Payroll where appropriate. Prices: from £125 to £175 per month, ex VAT. 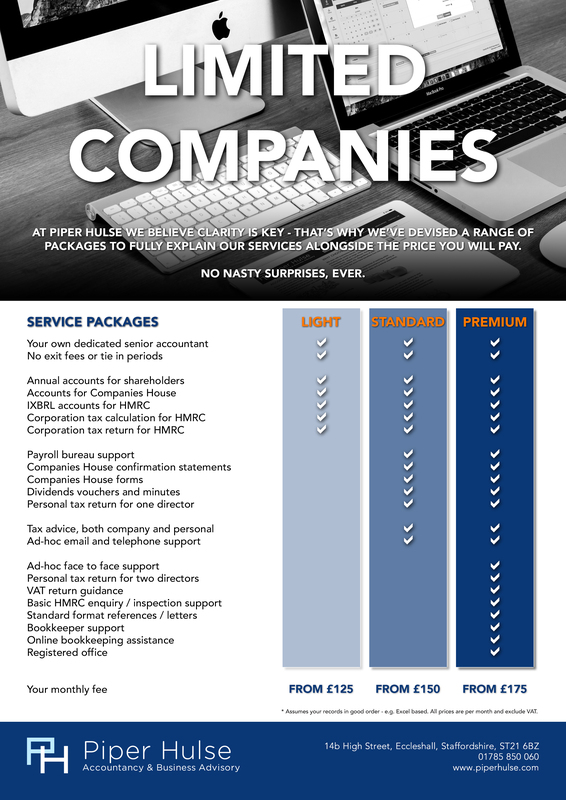 Download a copy of our latest Limited Company Packages guide here.